The bodies piled up in the police hospital had begun to bloat and decompose when Sarah Wati arrived on Monday with a bullet wound in her foot. In the wake of a 7.5-magnitude earthquake and a 20-foot tsunami on Friday that killed at least 844 people, the eastern Indonesian city of Palu was still reeling. Hungry residents were begging for aid, armed men were foraging shuttered stores, crowds besieged the airport and mass jail breaks left prisoners roaming free. Ms. Wati had been in a jostling crowd, watching as around 20 people attacked an A.T.M. with pickaxes, she said. Nearby, the police shot in the air and then sprayed bullets to clear the plunderers and onlookers. Ms. Wati, 20, jobless and the mother of one, was hit in the melee. Even with medicine administered at the hospital, she was in tears from the pain and shock. 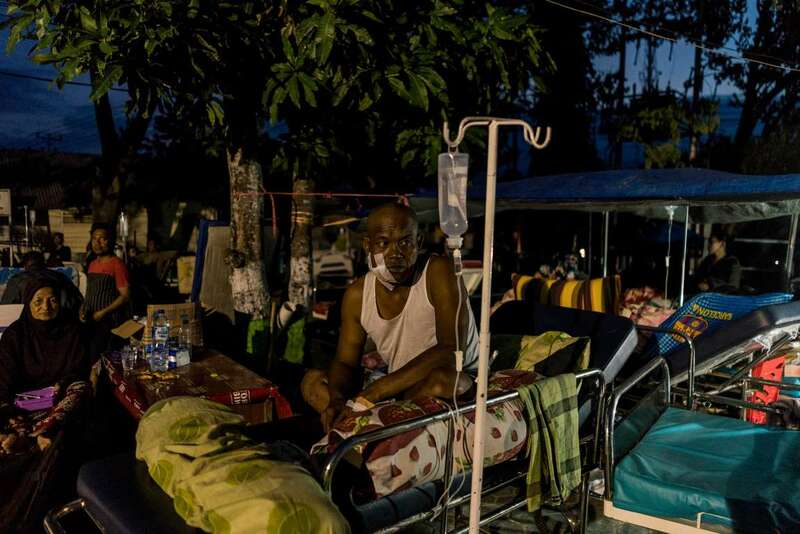 Three days after the twin natural disasters, Palu, a city of about 380,000 people, was consumed with the task of identifying the dead and ministering to the living, some still trapped under sheets of fallen buildings. Frantic rescue efforts were hampered by limited heavy equipment, and police were busy dealing with looters. While President Joko Widodo said he welcomed international aid, none had yet reached the disaster zone. At the site of some collapsed buildings, workers were forced to work by hand, pulling away chunks of rubble. National disaster response officials warned that scenes of devastation were being replayed all along the central coast of the island of Sulawesi, especially in remote regions. The death toll, magnified by the failure of a series of early warning systems, was likely to rise even higher. Landslides and roads heaved upward by the earthquake blocked rescue workers from reaching entire villages. A team from the Indonesian Red Cross discovered the bodies of 36 people in Sigi, just south of Palu, on Monday. These fatalities do not appear to have been included in the government’s official count, so would add to it. In Donggala, a fishing region near Palu, hundreds of residents huddled in makeshift camps by the roadside, either because their homes were damaged or for fear of aftershocks. “The situation in the affected areas is nightmarish,” said Jan Gelfand, head of the International Federation of the Red Cross and Red Crescent Societies, citing the dire lack of food, water and shelter for survivors. At least 2,500 homes in the region were destroyed, with some buried in mud, when the earthquake caused the ground to flow like a liquid, a process called liquefaction, Sutopo Purwo Nugroho, the spokesman of the disaster response agency, said. On Monday morning, thousands of desperate people stormed the Palu airport, many apparently trying to flee the stricken city. The rush on the runway was so frenzied that an Indonesian Air Force plane filled with relief supplies was unable to land. The airport, hampered by a damaged control tower and cracked runway, was briefly closed. More than 1,000 convicts escaped from three local jails, the Indonesian authorities said on Monday. One jail was set on fire. But capturing the inmates was not a top priority for the overstretched police, Ministry of Justice officials said. Residents walked dazed through town, clambering over fractured roads to search for missing family members. Others steeled themselves for a trip to the police hospital, part of which has been turned into a makeshift morgue. On the road into Palu, supplicants stopped cars, pleading for anything: fuel, food, water. At least two aid vehicles were besieged by mobs. Rescue efforts in Palu continued to focus on a crumpled hotel and a shopping mall, buildings where the hope was greatest of still finding survivors. At the ruins of the Roa Roa, once a cheery eight-story business hotel, a digger shifted large slabs of concrete to try to reach people trapped underneath. On Sunday, a woman was pulled alive from the wreckage. In this stiflingly hot city just south of the Equator, the authorities tried to dispose of bodies quickly, burying them in a mass grave after first taking DNA samples so that identities can be confirmed later. President Joko, who visited the area on Sunday, declared a national disaster, paving the way for the country to begin accepting foreign aid. In previous instances, local authorities had said they could handle the relief efforts themselves and turned away offers of overseas assistance, prompting much criticism. Questions remained about whether the country’s notoriously inefficient bureaucracy could have done more to reduce the loss of life. Indonesia’s thousands of islands are dispersed across one of the most seismically dynamic expanses on earth. Central Sulawesi Province, where the earthquake struck on Friday, is regularly deluged by tsunamis. Yet Indonesia’s tsunami early-warning system is a mess. A network of 22 buoys that is supposed to monitor for movement on Indonesian open water has not been operational since 2012. Nadrah, who like many Indonesians uses one name, said residents of Donggala received no warning of the tsunami. No sirens sounded. No text messages pinged. But Ms. Nadrah, 54, has known from her childhood what can follow when the earth quakes. “Our parents taught us that if the shaking is scary and lasts a long time, a tsunami will come,” she said. So she ran run to higher ground once the tremors subsided. One of the worst tsunamis in recorded history struck the northern tip of the Indonesian island of Sumatra in 2004, killing more than 130,000 people there. People died in 13 other countries in that tsunami. Some of the defunct warning buoys have become moors for fishing boats, destroying the sensitive equipment within, officials from the national meteorology, climatology and geophysics agency said. Mr. Rahmat said the buoys were not crucial to Indonesia’s disaster preparedness. The magnitude of Friday’s earthquake was strong enough that it set off an automatic tsunami warning for the Palu area, based on seismographic modeling. But even though an alert was raised, residents of Palu and Donggala said they had been given no sign, such as a siren, about it. Another system that could help with early tsunami warnings, tide gauges located closer to shore, proved useless because they had been set to provide data every 15 minutes, rather than at more frequent intervals. In the case of Friday’s tsunami, three successive waves inundated the coast within 11 minutes of the earthquake hitting, meteorological officials said. The gauge nearest to the site of Friday’s tsunami recorded only a 2.3-inch rise in water levels when the reality was as high as 20 feet. Mr. Sutopo, the disaster agency spokesman, said on Monday that the biggest wave crested over electricity poles in Donggala. Yet even if residents of Central Sulawesi know to scramble to higher ground — either from muscle memory from previous tsunamis or from government alerts — there is no network of tsunami shelters built on its vulnerable coasts.